Cute cake!! That's so impressive :) It looks great! You did a great job on the cake! It looks amazing! Huge Disney fan and a Huge fan of that cake!! My one question, how black was everyones mouths? :) Stopping by from the pintastic monday link party! This cake is so cute! I love how easy you make it look to make it too. Thank you! We escaped with minor teeth coloring! :) Thank you so much for stopping by! I LOVE new blog buddies! It truly is SUCH an easy cake to do! Thanks for stopping by! Thank you! I definitely linked up. I appreciate the invite! Thank you so much! It really was special...my little man absolurely LOVE it! Thank you so much for your kind compliments! I hope you find the tutorial easy to follow! 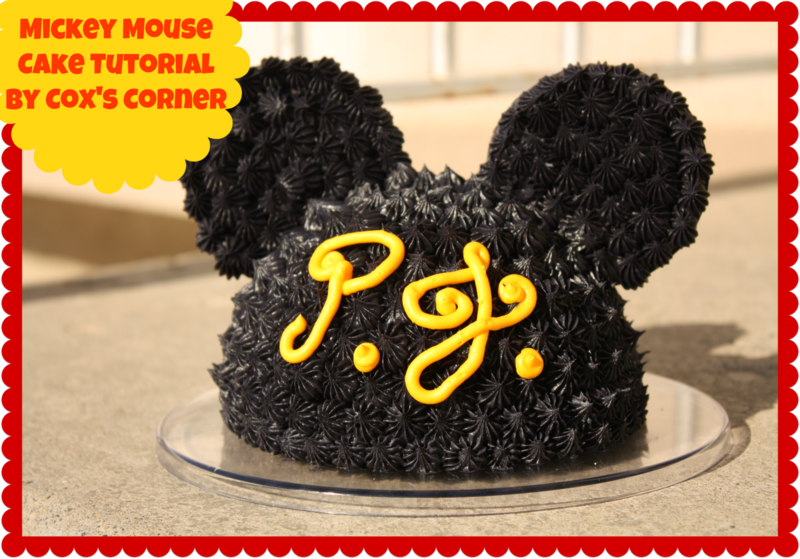 I love this mickey mouse cake! The way you came up with the ears is so creative! Thanks for linking up at Romance on a dime. Pinning this. This is so cute! 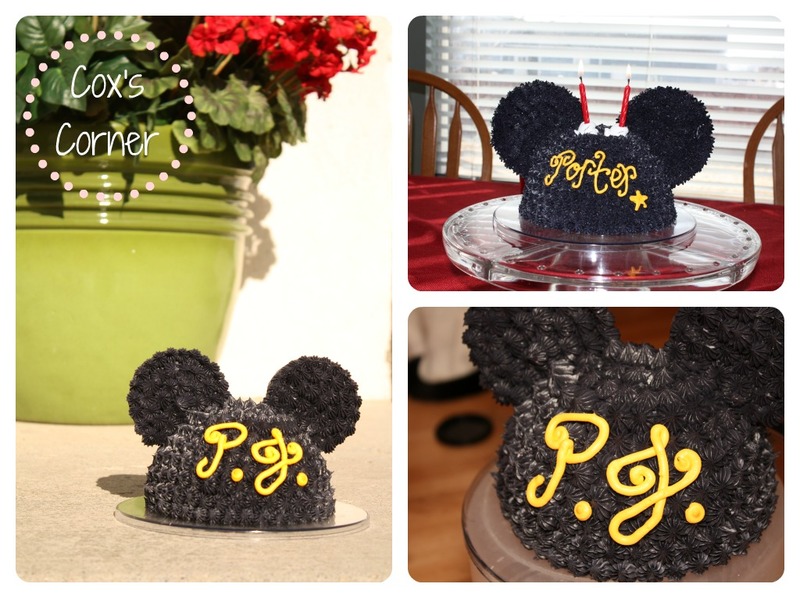 My kids love Mickey Mouse...I may have to make one of these one day. Thanks Betsy! I'm all about trying to use what I have on hand! :) I bet you could also use something like sugar cookies for the ears... Thank you so much for the pin! I really appreciate it! Thank you! 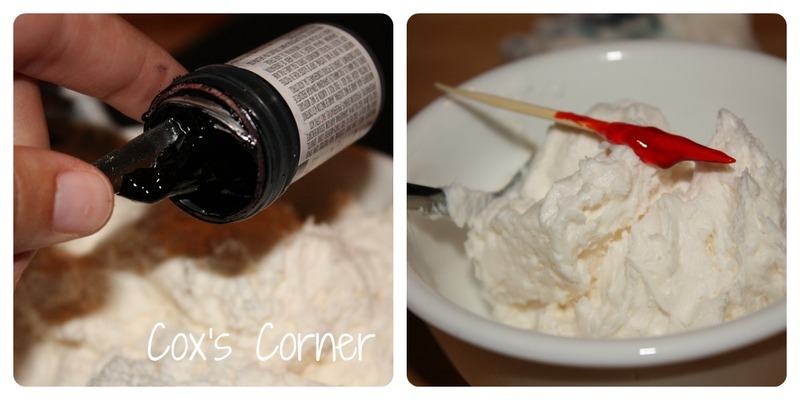 It is super easy to make! I bet your kiddos would love it. If you have any questions let me know! I'd love to see it if you do make one! OH MY GOSH!! My daughter's first birthday party is next Saturday (Minnie themed--and being documented on my blog) and I've been looking EVERYWHERE for something like this for her smash cake. Thank you times a million!! I found you through Tip Junkie Tip Me Tuesdays---and I'm SO glad I did! Seriously, NO LIE about the color of the business. That's an alarming thing to learn, but kind of cool too. I know right?! I actually figured it out with my own...I was quite alarmed when it was blue! Then I remembered that I ate a BUNCH of this cake the day before! So cute and so smart! Thanks for sharing! You don't even need a pan for this! Just an oven safe mixing bowl, like Pyrex! Thank you! And, thanks for hosting the weekly party! This is soo stinking adorable! Love the ears! Thanks so much for sharing with the Pink Hippo party! Awesome job! I love how it turned out! Thanks for sharing at the Pomp Party! Pinning to our Pomp Party board! Wow! The cake turned out amazing. I'm hosting a linky party "One Creative Weekend" at OneCreativeMommy.com. I'd love for you to visit and link up this idea and/or anything else you'd like to share. This looks incredible and would be just perfect for the night before we leave for Disney! Can't wait to give it a go. Very nice cake! Thanks for linking up. I'm sure the blogger event was wonderful and am looking forward to seeing pictures! This is so cute! I love Mickey Mouse, this is so fun! How cute! Thank you for sharing this at Saturday Show and Tell. I can't wait to see what you have for this week! I look forward to seeing you there. My daughter would love this! I am visiting from the sassy sites link party. I am you newest follower! I blog over at http://www.garagesalesrus.blogspot.com/ I hope you will stop by and do the same. I also have an awesome giveaway going on with a Cricut Machine! It's only got a few hours left on it so hurry over and enter! This is amazing! Thanks so much for sharing it at my Say G'Day Saturday linky party. I've pinned it and shared it on Facebook and Twitter! This week's party has started so please pop by and say g'day if you have a minute! Oh thank you! I'd love to link up. Thanks for the invite! You should! It is seriously SO easy! Thank you! It was a blast! I will definitely be posting pictures soon! I'll definitely be back! :) Thanks for hosting! Thank you so much for the feature! I appreciate it! It goes together so fast and is really easy! Just make sure they brush their teeth really well after (the black food coloring :) ! Thank you so much for sharing my post! :) I'll definitely be by to link up! Oh Thank you so much for featuring my project! It truly is an honor every time! I'll definitely be back to link up more! Fantastic job. You are so creative! Thanks for sharing this week at One Creative Weekend! Thank you! And, thanks for hosting! Adorable!! I'm sure I've told you that before... but it is! Super cute! I'm pinning for later. Just a question...could you maybe use thicker sugar cookies with toothpicks stuck in the edges to make the ears? You know... so they would be edible? Just trying to think of a way to make the ears out of something you could eat...but maybe they would be too heavy? I would like to know what you used for the ears .Did you cout out cardboard or the lids themselves? Thanks girl! 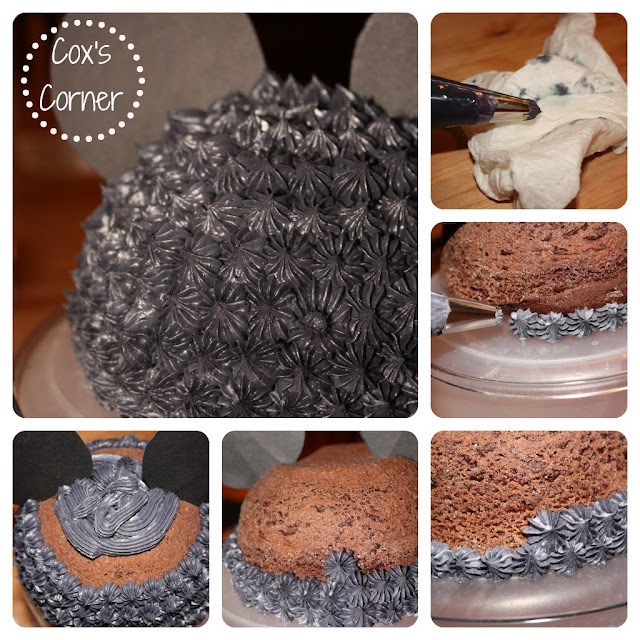 Thank you so much for featuring my cake! We used the Wilton Cake Decorating food coloring that comes in the little jar/container and I really didn't notice a difference in taste. But I'm not too picky...so we really didn't have any problems. I hope that I was able to answer your question! If you do try it, let me know how it goes! I just used a glass pyrex bowl. Most are oven safe, so if you check your bowl and it says its ok, you should be good to go! Let me know if you have anymore questions! I'm going to try this ASAP, it'll be perfect for the 1st birthday I am planning. Can you list which size Pyrex bowl? I assume you flipped it upside down and then just started frosting? Did you do anything special with the cake, what was the cooling time, etc? Thanks so much! I used the smallest bowl in the set of three that you can buy together. I wanted it to be a small cake. You can really use any size of pyrex bowl. That's exactly what I did. I just flipped it and started frosting. The key with the cake is to let it cool COMPLETELY before you start frosting, otherwise it gets crumby. Other than that I didn't do anything different. I prepared it the same way the directions on the box said to. I hope that helps. Feel free to reply with any other questions! If you start off with chocolate icing, you won't need as much black food coloring. If you start off with the white, color the icing a green or blue, then the black. Just a tip! Thanks for the tip! I'm going to have to try that next time!